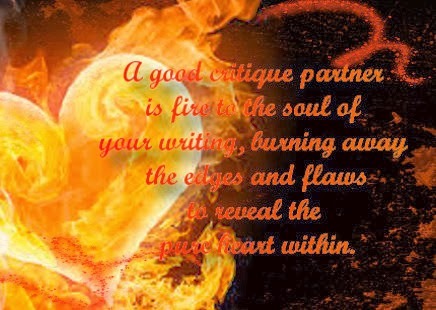 If you are a writer then you know the value of a good critique partner. An effective CP has attentive eyes, ears, and emotions. He/she has x-ray vision, spotting the outer structure of scenes and chapters. Even the crumbs you scatter as you knit the overall plot throughout the story glows visible to them. Amazing how they can see the flaws through your forest of phrases, where all you saw was your story coming together. Over the last few weeks, my critique partners have been reading my current middle grade manuscript. A few days ago, I began studying their notes and comments, jotting down my observations of their findings. As I was doing so, I had a thought: Why not share this journey with the Alleywalkers? I mean, I did tell them I'd start sharing more from my Sheriism box. This is the first post in my series, Studying A Critique Partner's Notes. I'll dissect how I shift through their comments to find what works for me and the intended meaning of my story, overcome the fear of axing some of their valuable advice, and show how I apply it all to my final draft. After typing 'THE END', I let the manuscript sit until after I received notes from a few CPs. I then did the same with my other CPs' documents. Doing this gave me a road map, an outline of what may or may not need fixing, especially when more than one CP made the same suggestion. I waited until I received at least two CPs' suggestions back before I began this process. Each was fresh in my mind, which made it much easier for me to compare any similarities between the two. Within a day, I received a third CP's suggestions, so I included hers as well. With this manuscript, I had four people reading for me. I hadn't received #4's suggestions yet, so I decided to use this last CP's notes as a check at the end of my revisions. NEXT week: In The Trenches - of taking those notes. Do you have a system to initially read your CP's edits? That's a great idea. Having peeps from different genres read. I like that! That's such a great quote. I couldn't agree more. Awesome. I have an in house content editor, so that helps with the process, but I'm about to launch back into the CP zone. I'm such a perfectionist that it always gives me the jitters. Guess that's something we just have to get over, eh? With critiquing, I used to immediately jump into the notes. However, I've learned to skim them when I receive them then step away, allowing certain items to marinate. It's much easier to go back after a few days and begin dissecting my CP's comment with my intentions and voice of the story. Also, doing it this way, I can see how a CP may note something one place then find that it has been addressed later and satisfied their initial comment. It can be tedious, but worth it to use the nuggets of insight provided while being okay with letting go of the rest. And when I have multiple CP's noting the same thing, that is such a major flag, so I note that as well. Stepping back is vital, at least for me. I totally agree. It's something that's taken me a bit of time and experience to learn. At least I'm learning, right? 'Flaws in the forest where you saw the story coming together.' -- That's perfect. Yes. That reassurance is what I yearn for. Always makes me feel better! I haven't had more than one beta read at a time yet. But if I did, I'd wait for all the comments first. Critique partners are really invaluable. I become blind to some of the flaws in my writing as I'm sure others do too. I think you're bringing up a good point. I used to only have one reader; now I have four. Maybe two or three is enough. It's so valuable to have more than one CP, that way you can compare and see what really needs to change and what might need to stay the same. I just found my CP's recently when I started writing YA fiction, so I'm still working out a system. So far, it's going great! I don't know if I have a "system" per se, more like a general way of doing things, which honestly varies from book to book. I think the more I write, the less beta readers I need, but that could also be the deadlines talkin'! Makes sense the longer one writes the less comments they receive. YAY! for progress. I don't have a system as such, just three trusted critique partners. Two are writers and one is an avid reader. Like Alex, I tend to pay more attention to the things that more than one crit partner comments on. However, I always go with my gut when making the final decisions. Can't wait to read the next of this post! Yeah I go with my gut in the end but I try to let the comments all sink in for a while before deciding how to revise. I have had critique partners in the past and I love them. They have helped me so much. I don't know what I would without them. A good critique partner is priceless. I don't know that I have a method exactly. I just read through the comments, have a think, apply the suggestions I agree with or have a longer think over the suggestions I don't fully agree with. Yeah. It's all about the pondering. I like printing out the notes and reading them as I go through the MS. I do exactly what Lynda R Young goes- read, apply, then have a longer think! =) And thank goodness for cp's, don't know what I'd do w/out mine! I know, right. It always amazes me how they see what I can't and vise-versa. Thanks so much for stopping by. I really appreciate it! This is a wonderful post. I'm always curious to see how others go through this process. I initially got my critique partners a little too late in the game on my current novel, but when my next novel is finished, I'm definitely going to use this process you mentioned.